Formed into 1817 and already surrounded by states on all of its borders, the Alabama Territory lasted just two years before becoming the 22nd state on December 14, 1819. However it would take 65 years for Alabama to see its first brewery. In 1883, Philip Schillinger, a German immigrant, moved his family from Kentucky to Birmingham Alabama with the intent of establishing a brewery in this fast growing city. Philip already had experience as a brewer. While living in Kentucky, he and two partners created the largest brewery in Kentucky at the time, and it didn’t take long for him to repeat his success in the Magic City. In 1884, Philip created the Birmingham Brewery and introduced fresh brewed lager to the state of Alabama, and demand of the product quickly followed. The Birmingham Brewery continued to grow until 1893, when a economic downturn combined with a coal miner strike caused the company to slip into bankruptcy. Coming out of bankruptcy as the Alabama Brewing Company, production increased until 1907 when Jefferson County, home of Birmingham voted to become a dry county, starting the battle against brewing in the state of Alabama that is still affecting the industry today. Much like Mississippi, Alabama introduced Prohibition prior to the federal amendment, and continued to enforce the law well beyond the repeal of 18th Amendment, with some counties still dry today. The state did eventually loosen its grip on alcohol control, but it didn’t fully let go. So in 2004, the organization Free the Hops was formed to try to change the laws that restricted the making and purchasing of craft beer in Alabama. The first challenge Free the Hops took on was increasing the legal limit for alcohol content in beer. Like many other southern states, Alabama had a law that prevented beer from having an ABV greater than 6%. And as we mentioned before, that prevents many styles of craft beer from ever entering the state. Free the Hops won, and in 2009, the Gourmet Beer Bill was passed, allowing beer up to 13.9% ABV. A huge success for the group. After that success, they didn’t stop. There was still work to do. Alabama still had many restrictions, such as limiting bottle sizes to 16oz (changed to 25.4 oz in 2012), preventing home brewing (made legal in 2013). And many more that prevented the successful running of a craft brewery or brewpub in the state. As the laws slowly change, brewers are also making their way back into the state after a long hiatus. And this week, we have a few selections from the state to try. The first beer we tried was Kudzu Porter from the Back Forty Beer Company. Located in Gadsden Alabama, Back Forty brewed its first production batch of beer in January 2012, and with that first batch came Kudzu Porter. We held the Alabama tasting on Memorial Day, which was a beautiful day here in New England. 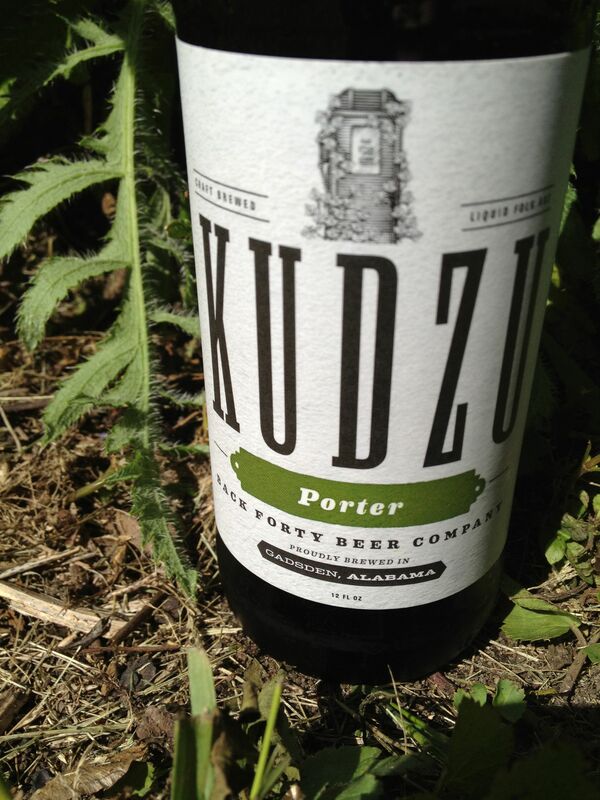 While sitting in the backyard, enjoying the sun, I found the Kudzu to be a nice light porter. Nothing overwhelming in flavor department, but refreshing. Perfect for enjoying on a summer day. I continued to go back to this beer a few more times during the week, and it grew on me more each time I had it. The slogan on the bottle says Careful, It will grow on you! which is a play on the characteristics of the plant Kudzu. An invasive plant introduced to the U.S. in the late 1800s, this plant now dominates the sides of roads throughout the south, enveloping the rest of the landscape. For this beer, the slogan fits, as it did grown on me. Another beer we tried from Back Forty was their Freckle Belly IPA. This beer also rolled off the production line in January 2012, and while very young in the beer world, this was an enjoyable IPA. Right from the opening of the bottle, we could smell the hops in this beer. It wasn’t the best IPA we have had on this project, but it was an enjoyable beer, with all but one of the tasters enjoying it. Back Forty isn’t the only brewery working to fill the void in Alabama. Blue Pants Brewery out of Madison is another craft brewery helping to change the beer drinking scene in Alabama. 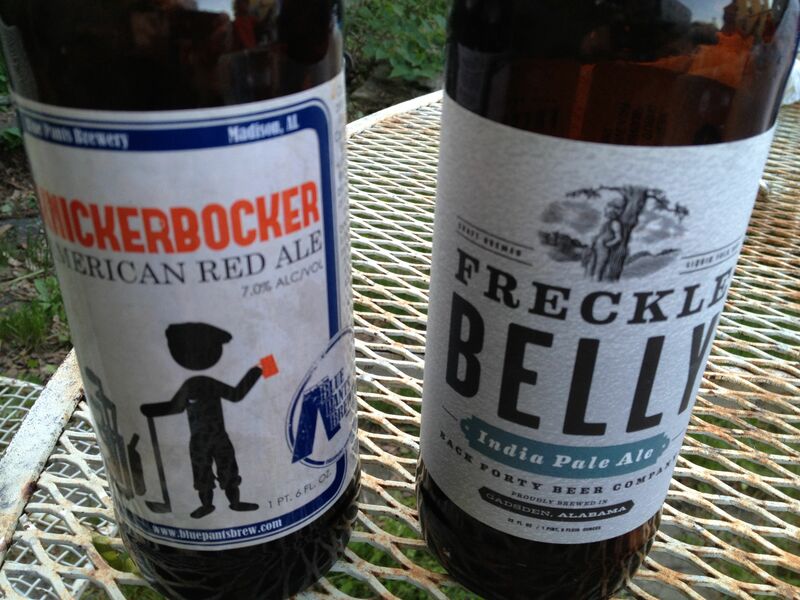 From Blue Pants, we got our hands on a bottle of Knickerbocker Red Ale. Listed as their flagship beer, the Knickerbocker was an interesting beer. In the glass, it was dark red, almost caramel in color, and it was full of carbonation with a biting aftertaste. A little too much for my liking, but others in the party loved it. The final beer of the evening came in a can. Brewed by Good People Brewing, in Birmingham, we ended the tasting with a double IPA called Snake Handler. 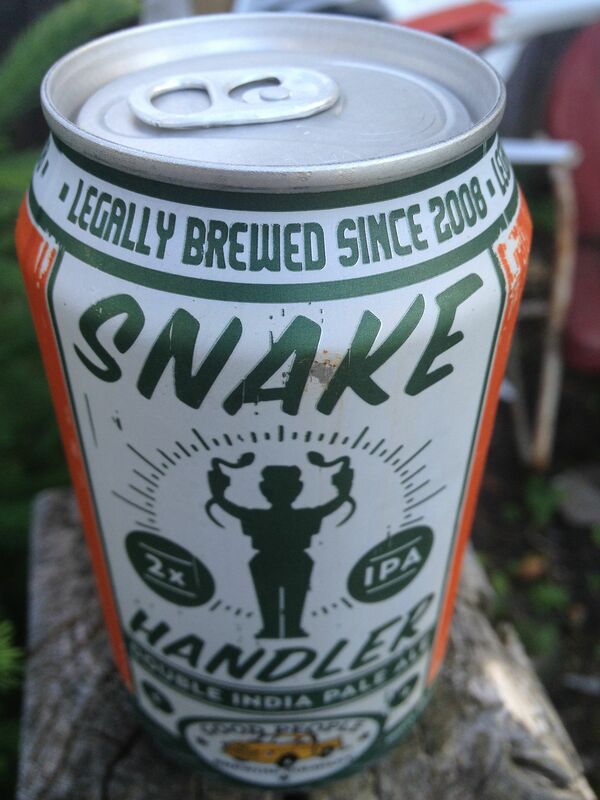 Printed around the top of the can, Snake Handler can says “Legally Brewed Since 2008″, a play on both the slow to change laws of the state and the notion of backwoods illegally brewed concoctions. Like the Freckle Belly before it, this beer was hoppy, and I really liked it. In the heat of the day, it went down well. The bitterness of the hops really helped to cut through the thirst. This beer was well loved across the tasting party. We could have used about 6 more. In the end, it is nice to see how much the beer scene in Alabama has changed since we had our wedding there in 2001. At that time, all we could get for the reception party were flavorless beer made by big national brands. There was no craft beer scene at that time. But things are changing for the better and we had the privilege to try three different breweries that are working on putting Alabama on the craft brewing map. Next week, check back for Maine, and a huge milestone for 50 states of beer.